In thousands of applications today, rolling bearings, plain bearings, and linear guidance systems are indispensable. Our precision products contribute to progress in everything that moves. However, only with an in-depth understanding can they be used in such a way that ensures their full potential is reached. 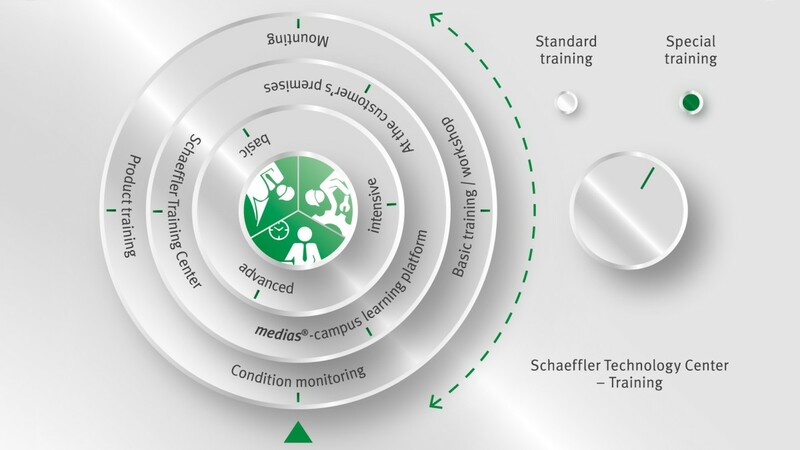 This is why the Schaeffler Technology Center – Training has a modular range of training courses on offer, which fully cover the individual information requirements of technical and commercial employees. System: The courses cover basic principles through to in-depth specialist knowledge of rolling bearings, mechatronics, systems engineering, assembly, dismantling, and condition monitoring. The progressive learning processes are taught at basic, advanced, and intensive levels. Trainers: Trainers are qualified in terms of didactics and methods and ensure maximum learning success is achieved in compact training units. They also ensure practical knowledge transfer takes place in different languages at local locations. Quality: Findings from market observation, exchange of experiences, feedback, and ideas and suggestions from participants are integrated into the continuous improvement of the training course program. The Schaeffler Technology Center – Training is also certified according to ISO 9001:2008, which is thanks in part to our high demand for quality. This option allows you to remain flexible as you choose when you wish to study and you decide in which order you’d like to study topics – on the medias-campus learning platform, new knowledge is only a few clicks away. Choose between products, rolling bearing fundamentals, mounting, and condition monitoring. Subsequent tests allow you to see the learning progress you have made. Please click on the link below to visit the Schaeffler Group “Campus”.